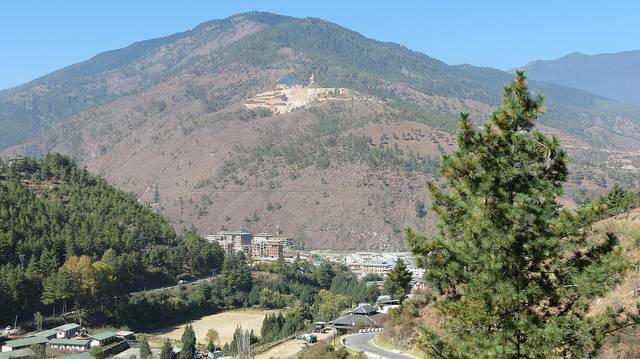 Slide off in the rice bowl of Bhutan and experience bliss at every sight of this little city. A tranquil place caressed in nature’s lap with the two rivers Mo Chuu and Pho Chuu through it, is Punakha, an erstwhile capital city of Bhutan and is the winter residence of monastic body. Punakha has many spectacular buildings that epitomize Bhutanese religious architecture. Punakha Dzong is one such monument which is also known as ‘Palace of Happiness' and is the second largest Dzong in Punakha. It is situated right at the meeting of these two rivers. The ‘One hundred pillar hall' has many paintings which is a sight to see and the remains of Zhabdrung Ngawang Namgyal is preserved here. This dzong opens to visitors in summer and during festivals. Chimi Lhakhang is a fertility temple as it is frequented by childless couples. It was built by Lama Drukpa Kunley. Khamsum Yuley temple, commissioned by Queen Mother, stands on a hillock surrounded with the waters of Mo Chuu River and mountains. Paintings of Buddhist teachers can be found here. Many excursions can be done around Punakha. Do visit the Ritsha village which has rice fields grown along the two rivers and exotic landscapes. Enjoy rambling on the Punakha Suspension Bridge and after crossing the bridge and walking past a few farmhouses lies a place called Lambhukha hidden in the dense forests and splendid environment which is an epitome of peace. Its inhabitants were the peacemakers in the Medieval Age. In their honour, a Festival called Serda is celebrated where men carry peace flags. Sangchen Dorji Lhuendrup Lhakhang Nunnery calls for a visit as it is perched on a hill and overlooks the Punakha valley which is a sight so beautiful. The biggest statue of Avalokiteshwara is stored here. There are many other statues that include Gautama Buddha’s, Tsela Namsum's etc. Rafting the calm waters of the river Mo Chuu River adds new dimensions to the pleasures. Punakha is also famous for its colourful festivals which are held in February which will mesmerise you thoroughly.